Present like a pro with the EX7240 Pro wireless projector, boasting enhanced features and comprehensive connectivity for the latest devices. Project HD-quality presentations and video from laptops, smartphones, tablets and streaming devices. Offering 3x Higher Color Brightness (1) and up to 3x Wider Color Gamut (2), Epson 3LCD projectors display colors far more accurately than competitive DLP projectors. Portable and easy to use, the EX7240 Pro delivers widescreen WXGA resolution (1280 x 800), plus 3200 lumens of color brightness and 3200 lumens of white brightness (3). It also includes HDMI, MHL support, and quick wireless setup. For powerful, future-proof performance, choose the EX7240 Pro. 1. Color brightness (color light output) measured in accordance with IDMS 15.4. Color brightness will vary depending on usage conditions. Leading Epson 3LCD business and education projectors compared to leading 1-chip DLP projectors, based on NPD data for June 2013 through May 2014 and PMA Research data for Q1 through Q3 2013. 2. Gamut volume of leading Epson business and education projectors compared to leading 1-chip DLP projectors, based on NPD data for June 2013 through May 2014. Volume is measured in 3D in the CIE L*a*b* coordinate space. 4. To use Epson iProjection, the projector must be configured on a network. Epson projectors can be networked either through the Ethernet port on the projector (check model specifications for availability) or via a wireless connection. 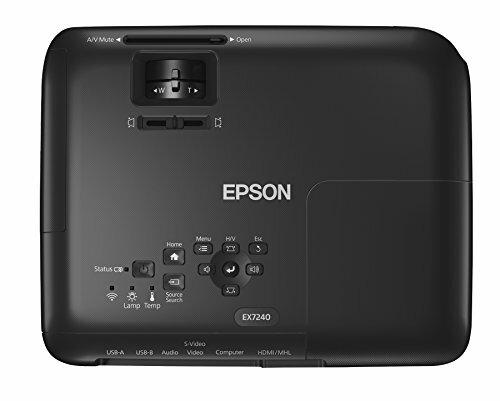 Check your owner’s manual to determine if a wireless LAN module must be purchased separately to enable wireless connection on your Epson projector. Not all Epson projectors are able to be networked. Availability varies depending on model. 5. Based on TFCinfo: US Projector Brand Customer Perception and Preference Study, Multimedia Projectors 2015. 6. Color brightness (color light output) measured in accordance with IDMS 15.4. Color brightness will vary depending on usage conditions. Compared to leading 1-chip DLP projectors, based on NPD data for June 2013 through May 2014 and PMA Research data for Q1 through Q3 2013. 7. Data source: ProjectorCentral.com, Jan. 2014. Average of 1243 shipping models for which the manufacturers provided lumens and total power data, all resolutions and brightness levels. Energy efficiency was measured as wattage per lumen. It was measured for both 3LCD and 1-chip projectors in each of six brightness segments. 3LCD projectors averaged less required electricity per lumen in each of the six segments. 8. 9 out of 10 people preferred images from leading 3LCD projectors over leading 1-chip DLP business and education projectors. Leading projectors selected according to NPD data as of July 2013. Based on independent U.S. research conducted by Radius Research (July 2013). 9. ECO Mode is up to 10,000 hours. Normal Mode is up to 5000 hours. Lamp life will vary depending upon mode selected, environmental conditions and usage. Lamp brightness decreases over time. 10. iOS supported formats and files: Microsoft Word (.doc, .docx, Office 2003 or later), PowerPoint (.ppt, .pptx, Office 2003 or later), Excel (.xls, .xlsx, Office 2003 or later), Keynote (.key ’09 format; Keynote 6.0 not supported), Adobe PDF (.pdf, PDF 1.7, Acrobat 8 compatible or later), JPG and PNG; Android supported formats and files: Adobe PDF (PDF 1.6), JPG, JPEG and PNG. 12. SmartWay is an innovative partnership of the U.S. Environmental Protection Agency that reduces greenhouse gases and other air pollutants and improves fuel efficiency."